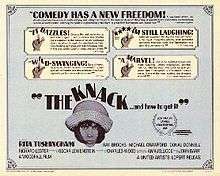 The Knack …and How to Get It is a 1965 British comedy film directed by Richard Lester based on the play by Ann Jellicoe. It won the Palme d'Or at the 1965 Cannes Film Festival and was nominated for the Golden Bear at the 15th Berlin International Film Festival. It received the Grand Prix of the Belgian Film Critics Association. The film depicts the sexual competition among three roommates — the aggressive, womanizing drummer Tolen (Ray Brooks), the shy, paranoid schoolteacher Colin (Michael Crawford), and the artist Tom (Donal Donnelly) — when a young woman from out of town, Nancy (Rita Tushingham), enters their London world. Lester himself makes a brief cameo as an annoyed bystander. John Barry contributed the jazzy score, which features a memorable organ solo by Alan Haven. Jane Birkin, Charlotte Rampling, and Jacqueline Bisset all made their first cinematic appearances in the film as extras, together with Top of the Pops disc girl Samantha Juste. ↑ "Festival de Cannes: The Knack …and How to Get It". festival-cannes.com. Retrieved 2009-03-04.